Fiona Kelly is the founding Director of The Shutter Shop. She set up the business 29 years ago from her home in Hampshire with her first order worth just £316. In addition to founding and growing the business to the household name it is today, she raised her 4 children. One of whom, Ben Kelly, joined the business in 2015 and is set to take over the reins and manage the business through the next 30 years and beyond. 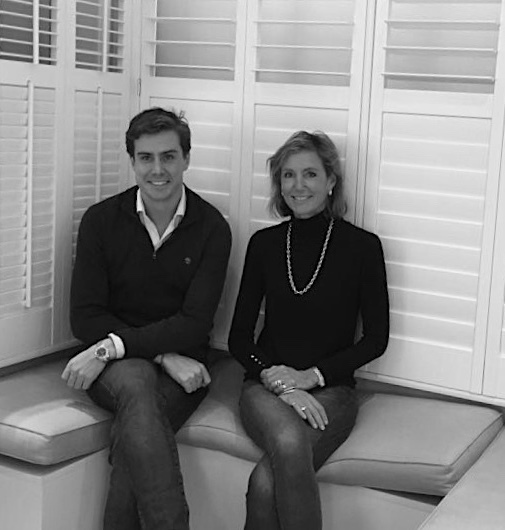 We sat down with both of them to talk about founding and growing a successful business, how the interiors industry has evolved and the true meaning of a family business. Fiona, tell us a little about how and why you set up The Shutter Shop? I used to work for Manuel Canovas, the French fabric house, and about 30 years ago I went to the States on a business trip with my then husband. Whilst I was there I saw shutters on the houses, which at the time were not available in the UK. So I decided to set up the business from home by placing an advert in a magazine which led to orders coming in and I would ship them over from the USA. How quickly did the company grow? F: The Shutter Shop grew steadily, until the dollar went upside down and it became unfeasible to continue to ship them over. So at that point we started working with a company based in the north of England, unfortunately they went bust as they couldn’t get the quality right, so we decided to set up a manufacturing company in Somerset. 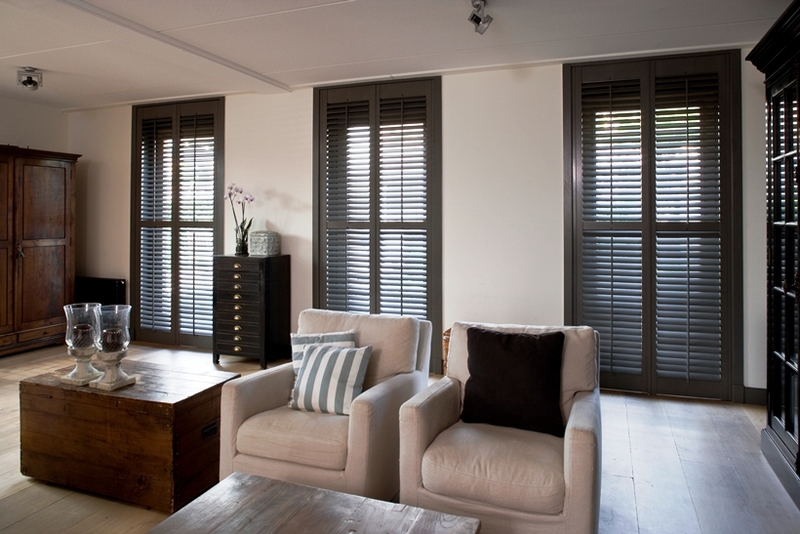 Do you still manufacture your own shutters? F: No, the set up in Somerset meant we were limited in how many customers we could service, but we were actually approached by a Chinese company around 14 years ago which coincided with our plans to move to London. This led to us setting up S-Craft which imports shutters to be distributed to retailers across most of the UK market. The Shutter Shop now buys from S-Craft as a Master Partner for London and across the UK. However, The Shutter Shop was my baby, is my baby and always will be my baby – sorry Ben! On which note, you’ve successfully raised a family alongside building your business, how did you manage to find a balance? F: I would work from my kitchen table in Hampshire when the children were little. As the children grew up and started going to nursery and junior school we moved into a little farm building in Hartley Whitney. I used to do everything – school run, ferrying the children around and I would work around them and in the evenings – really needs must. I needed the income so I was driven by them. I was only 23 as I had children young, and had a lot of energy – one of my children calls me the Duracell bunny as the batteries never run out! As soon as my youngest daughter went to boarding school at the age of 11, we moved The Shutter Shop to London because I was freed up from having to do school runs morning and evening! It meant we could really start to grow the business and we were able to move the operation to London rather than running it from Hampshire. All of your children have worked for the business at some point, was having four children a useful source of staff? F: They all earned their pocket money doing filing and making teas and cakes for everyone in the office. Ben used to drive the white van doing deliveries in his holidays, so they’ve all been a part of growing the business in one way or another. Ben, you joined the company full time in 2015. Was it always the plan that you would join the company? I never really thought that shutters would be something that I would necessarily go into. I remember the business being run from my bedroom at one stage, so I have always grown up with it. I did a number of different jobs before I came here and it actually took a fair while for me to decide that it was something that I was interested in. Partly because I wanted to build up my own experience of different industries and I felt it was important to have experiences in different fields and to bring new ways of working. Did you work in the interiors industry? B: No, not at all – after university I briefly worked for a recruitment consultancy, before joining the wine trade doing private client broking. I then joined Tesco, still within wine, to work for them on their corporate side and help them develop aspects of their business including their online business. One of your first major projects was updating the website, incorporating the successful DIY design and buy online service. Did you know what you were letting yourself into? B: Before I decided to join the company I took some time to review the business and how it could be improved and I never wanted to join the company and just run it as it was currently standing. I wanted to have an impact and grow and develop it. I was so impressed with the operation that started from such humble beginnings 30 odd years ago but saw a couple of areas that could be improved on, one of which was the website. It wasn’t as good as some of our competitors and the offering didn’t really shine through. I felt that we could create further awareness and provide our customers with a better understanding of our products, our services and provide more information of some of the more technical aspects of the product as well improve the DIY section. We’re constantly working to improve it, most recently installing a tracking system so our clients monitor their order and see how it’s progressing. There are constant updates which are trying to give our customers as much information as they could possibly want. The Shutter Shop is a true family business, how do you manage to keep work and home separate, or do you find yourself talking shop over the dinner table? F: Funnily enough outside of work Ben and I give each other a kiss on the cheek and say hello like a typical mother and son, and we don’t bring it up in conversation. Unless we’ve scheduled a meeting, but otherwise it’s very separate. Would you agree with that Ben? B: I would do, I mean even to the extent that I call Mum “Fiona” at work and I call her Mum at home. It was a conscious decision which has become a useful way of separating the two. However, my wife Georgina, also joined the business 3 or 4 months ago and we do find ourselves having a quick chat about work when we’re at home in the evening, it is unavoidable! You’ve been in your Waterford Road showroom for 12 years, how has the area changed since you’ve been here? F: Enormously – it’s interior design alley now. We’ve got lots of lovely interiors and furniture shops all coming together which is great. I think people do wander down and enjoy being able to visit retail interior shops all in one design destination. The Shutter Shop has been in business for over 30 years – how have you noticed the market and product change? 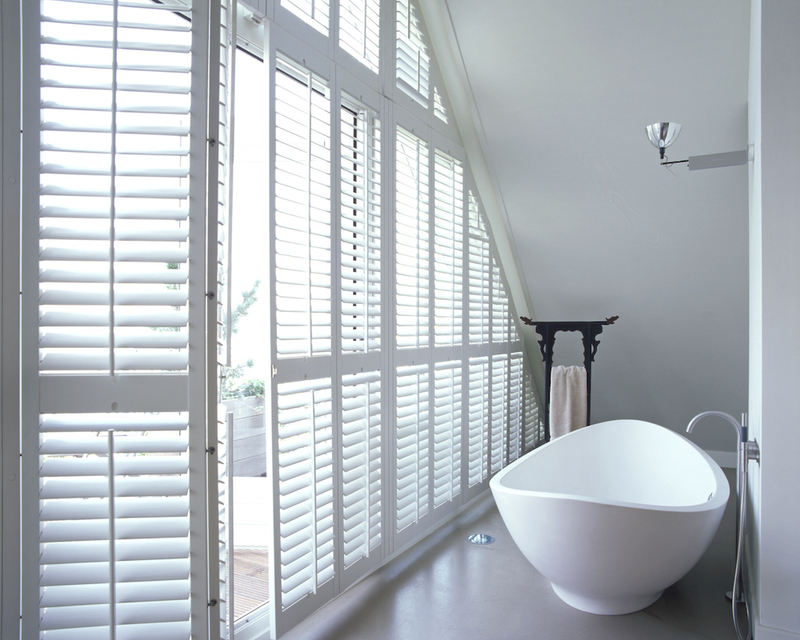 B: Shutters as an industry is growing – last year it grew about 25% over the year before because it’s still quite new and aspirational and there are so many windows in the UK that people don’t want curtains over, but they still want the security and privacy aspect of shutters and see them as a stylish alternative. 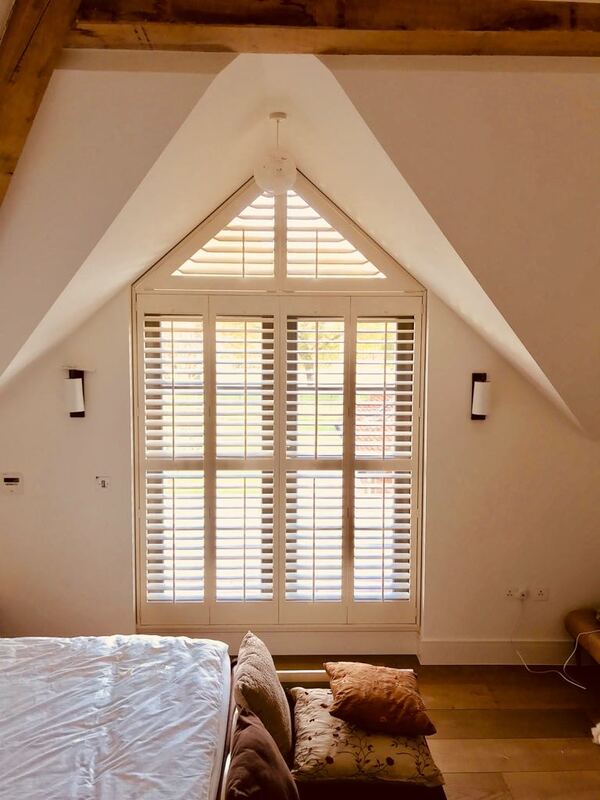 F: People are definitely going for wider shutters and wider louvre which are more contemporary rather than the little tiny louvres and small shutters – they used to go for tiny shutters with 32mm louvres, and now people tend to opt for wider shutters with a 76mm louvres. Have you got any advice for start up businesses hoping to start their 30 year plus journey now? F: You have to be driven and want to do it. It is pure hard work. There is no 9-5, so you have to really want and need to do it. B: I agree, there really is so much more competition out there no matter what industry you are in that it is the drive, passion and customer service that make your business stand out. Making sure that you are there however and whenever the customer wants. How has social media, or the change in attitudes that people want you to be accessible the whole time, affected your business? F: Well that was one of the reasons that Ben came into the company and one of areas he has focussed on, I wasn’t brought up with social media and all the SEO stuff that his generation are so familiar with! The company was plateauing before Ben came in because I hadn’t kept up with the modern day way of marketing and Ben has come in over the last 2/3 years and pushed the social media and the advertising and bought us back up to speed! Looking to the future – where do you see The Shutter Shop in 30 years time? B: I think over the years technology is going to move on and as a result the product will develop and evolve. It has developed a huge amount over the last 30 years and will continue to do so and we are still adding to the range. I think more and more there is a demand for an electronic element to the product. Our shutters historically and still to a greater extent are a manual operation, but as the product develops & changes and as people’s requirements change the product will move on and has to. F: The other thing is we do the remote controlled honeycomb blinds which is a very good add on product. They are electrically or battery operated in order to give people that extra bit. B: As well as product development, for me the key to our business and continuing to grow and succeed over the next 30 years will be down to the customer service, the quality & design of our product and the attention to detail that we have to give in order to make sure that every order counts! To really ensure that everyone we work for gets the best experience and shutters that they love. There’s a huge amount that will happen with the industry and the business. But ultimately it is the relationships with the interior designers and trade customers which will help us as a business develop. Part of being a member of Chelsea Design Quarter and the wider design network that we’re a part of, is that it’s all about the relationships that you build and the customers that you look after. How important are your relationships with the interior designers and architects? B: Very! Often, we are speaking about projects which can be 3 years down the line, we are very happy to go out and discuss projects at conception and enjoy being part of this process. We know the site may change completely, the measurements will probably not be right, but we are still able to give an idea of spec so that our clients have what they need to include the shutters in their designs. How do you typically work with your clients? B: Our product will probably be one of the last things to be installed into a project. After the initial conversations at the start of a project we might not hear from our customers again until 6 months before the end, and we quite often aren’t able to get in for a number of months after that. So, in terms of the time frames, of getting them measured, made and shipped it condenses down to a very small period of time which is true of most of our orders, both trade and retail. You’ve worked on many projects over the years from single windows to entire houses. Is there any one project or client that stands out for you? F: We’ve done all sorts of famous names, hotels etc – but at the end of the day all of our orders are important. I always took the view that an order is an order and each one is just as important as the last – and the next! And finally, are there future generations being groomed to join the business? F: He can’t pass the white van test! B: Yes – he’ll need to drive a van for a bit stuff some brochures – do all the bits that we used to do! Thank you Fiona & Ben for your time and for giving us such a great insight into The Shutter Shop. For further information and to view the full range of products available visit The Shutter Shop, 102 Waterford Road, London, SW6 2HA or go their website: www.shuttershop.co.uk.